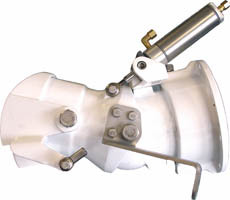 The new HYDRAULIC JET TRIM fits Berkeley style nozzle housing R1007, Berkeley style droop snoot R6007, and all Dominator & American Turbines including the SD-312. Features include Jet Tune nozzle inserts, low profile shift cable, larger hydraulic cylinder for bending the water at high horsepower level. A larger flow chamber for increased flow. Teflon encapsulated viton o-ring to seal the up-down nozzle.